…a.k.a the most overdone post in the blogosphere in recent weeks. Everyone is different… with different needs, different tastes and different budgets… so what works for me may not work for you but these are the products that have made this Winter a far more comfortable affair. It’s probably useful to let you know the kind of issues that Winter has been dishing out to me first right? Skin: A touch of seborrheic dermatitis that flares up with greater prominence when the seasons change and in cold weather. Dryness (with the odd patch of scaliness if left untreated for too long) around the edges of my nose, eyebrows, hairline, behind my ears (yeah, weird) and under my eyes. Nails: Where do I begin… these have suffered the most this winter and I’m starting to see the point in using acetone free nail polish removers despite still being in love with my poundland bargain purchases. My nails have started to peel quite badly on the edges and I’m having to trim them regularly just to remedy this. My cuticles are like elephant hide and the poor things sob everytime I approach with a new polish. As you can see… a few issues that have needed to be kept under control. It has literally taken me until the last week or so to pin down *which* products are having a reasonable effect on those issues and the ones I’ve shown above are the ones that I know are making a real difference. Dermalogica Daily Microfoliant (£28.50 – ish)* has been a gentler alternative to my usual scrubs at keeping my face free from flakes. I’ve started trialling a Clarisonic in the past week but up ’til then, it’s been the Dermalogica sloughing my skin without causing extra dryness or irritation. I can see why it’s so revered amongst industry experts. Liz Earle Superskin Concentrate (£37.80)* has probably been my skincare product of the year. 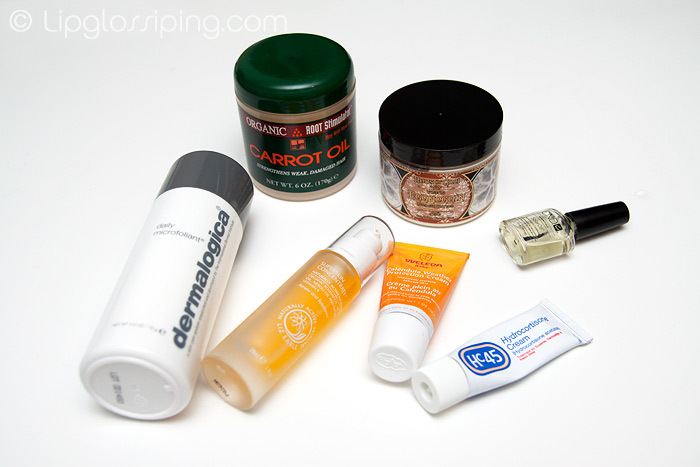 It’s one to avoid if you have oily skin but on my combo/dry skin – it’s a tonic and a half. As the weeks have gotten colder I’ve upped the frequency with which I’m applying and I’m on a full pump every evening spread all over my face (except the bridge of my nose!). It’s ‘organic’ scent takes a little getting used to and many will dislike the heavier feeling it leaves behind. Me? It lets me know that my skin is getting the nourishment it needs. Organic Root Stimulator Carrot Oil (£4.39) The range is targeted toward the needs of Afro hair and although it’s recommended use is on the scalp, I’ve been applying this on my hair 20 minutes before jumping in the shower. I combine this with Pantene Pro-V Colour Protect 2 Minute Damage Rescue Treatment (which I use as a conditioner rather than treatment) and have been enjoying much healthier and smoother-looking hair as a result! Haus of Gloi Pumpkin Butter (£5.70 – ish) Another ‘product of the year’ is the Haus of Gloi’s pumpkin butter formula for deep and long-lasting body moisturisation. I’m in love with the thick but absorbable creams… finding the perfect scent can be a bit like playing Russian roulette but at £5.70 for a full-size tub, it’s hardly breaking the bank. The site’s stock of pumpkin butter moisturisers is slowly dwindling, replaced by the lighter emulsions… that makes me sad – I’m hoping I have enough stock in my own beauty cupboard to last me through ’till it really does start getting warmer. Weleda Calendula Weather Protection Cream*(£5.50) Good enough for baby, good enough for me. It’s been my handbag staple for weeks now. The thinner-than-Vaseline texture and gentle scent make this intensely moisturising product my pick for on-the-go moisturisation. I apply a very small amount (half pea-sized for my entire face)… it spreads like a dream and although it’s lanolin/almond-oil based, sinks in fairly quickly without leaving me looking shiny aslong as I’m careful not to over-apply. Also wonderful for ravaged cuticles! CND Solar Oil – (£5.07 – ish) Whilst I’m not convinced it’s my HG for keeping my nails in good condition, it’s done a better job this Winter than my LUSH Lemony Flutter which is why I’m including it in the list. It’s inexpensive and quick to apply before or after a manicure. It smells divine (if you like marzipan!) and certainly goes some way to giving my poor tips a bit of respite. HC45 Hydrocortisone Cream (£3.77) This is a ‘branded’ version of a cream that should be used very sparingly indeed! I usually pick up a chemist-own version for a bit less than this. It’s a steroid cream that can thin the skin with prolonged use, hence the ‘sparingly’ comment. For me, nothing comes close at soothing my skin in an emergency. I usually use a miniscule amount behind my ears if the skin starts to crack (nice) or if I get wind burn. Leila also benefits from a smidge if her eczema gets out of control which thankfully this year, it hasn’t. So those are my winter skin saviours, it’s not the most glamourous list in the world and the price point varies wildly from a couple of quid, right up to £40 but these are the products that I haven’t been able to better. Love afro hair care come winter. I’m part African, so my hair has a lot of afro traits anyway, but they’re so jam packed with rich, moisturising ingredients that they can be real saviours. I’m looking forward to slapping Elemis Monoi Moisture Melt all over my scaly legs when I can bend again. I took your advice and bought some Lanolips and that’s lovely on my winter-ravaged kisser. Another lip balm I love is Dr Bronner’s organic lip balm in orange ginger. It tastes lush (it’s heavier on the ginger than the orange) and is only £2.99 from Ecohamster. Oh I quite like Dr Bronner (the liquid soaps) and I love ginger so shall pick a tube up! I wasnt a fan of lucas’s pawpaw but i really want to try lanolips. I have a feeling that will be my next big thing. My winter savour is burts bees lipbalm! lanolips should have got a mention on here really considering it’s all I’m using… but, I forgot about lip balms because I haven’t had any issues with dry lips this winter. Probably because of the lanolips… really should have remembered to include it whoops! Definitely my hydrocortisone (sp?) cream because my skin tends to get dry around the bendy area, eg, elbows, behind knees. Also, for my hands, my Nails Inc Vitamin E Oil Pen is something that I carry everywhere with me in the winter because my cuticles just look silly without it, and a good hand cream. For me it’s the OPI Avoplex one. I also suffer from dermatitis in the areas yo mention (except under the eyes). It used to get awful in winter or in very humid climates (erm…like London). The scaling around my nose has completely dissapeared now and my skin has never been in better condition since I use silica-ok tablets or silicol-gel (you can the tablets at boots/superdrug and the gel at Holland &Barret) which are also good for hair (a+). I still get the sacling behind/inside my ears but at least is not itchy! Now I don’t need to use anymore the hydrocortisone based gel that I have, in fact since I have’t used it it has dried out now! Seriously worth a try. I love Weleda! I like to use their Arnica massage oil in the winter as well (instead of a bodymilk after showering), especially around the waste/kidney cause it keeps you warm a bit. So many things I’ve never seen before. I saw some in Eastleigh… haven’t looked in West Quay – failing that, it’s online? I have quite a lot of that Organic Root Stimulator brand in my bathroom, it’s been a staple in our house for years and they have quite a good range of decent products. I use their Olive Oil spray before straightening my weave. Poor Leila I used to have eczema too but I’ve more or less grown out of it. Hopefully the same will happen for her. Daily Microfoliant is currently my failsafe as is Barrier Repair. Dermalogica has actually been a saving grace this winter! My hair has not liked the winter weather, lots of static and dull. If it wasn’t attached to my head I’d question whether it was my hair. I switched to Aveda’s dry remedy and it has helped a lot, the static has gone and the shine is back and it hasn’t made my hair lank. The shampoo is a bit unusual when you squeeze it from the tube it doesn’t lather in your hands. On early mornings I’ve found this confusing and thought I’d gone straight to conditioner. I bought my SIL some dream cream from Lush for xmas as it is supposed to be fantastic for eczema. Apparently doctors have started prescribing it. my skin goes all crazy in winter too and i frequently get eczema patches on my face. i recently tried the a-derma epitheliale h.a cream from boots and have been amazed with the results especially as its so cheap! using it with my avene thermal water spray has made a massive improvement to my skin! i also bought the dermalogica gentle cream exfoliant. im loving the fact that i don’t have to scrub my face to get rid of flakiness. i was going to get the daily microfoliant so will have to try that next!